Originally released in 1971, Ram was met with decidedly mixed reviews. It was McCartney’s second post-Beatles album and the only LP co-credited to his wife Linda. The album ratcheted up the production methods considerably from his previous outing and showcased the preciousness McCartney was always accused of during his tenure in arguably the most popular band of all time. For 2012, Ram has been remastered and comes in several formats, which include b-sides and unreleased tracks. While the initial reception—coming just a few years after the split of the Beatles—elicited vitriolic criticism in some cases, history has been kinder. It’s not the “unbearably inept” or “emotionally vacuous” album John Landua originally declared in Rolling Stone. In fact, when considered through the prism of today’s over-the-top “art” acts, Ram sounds like an indie-pop bedroom album. 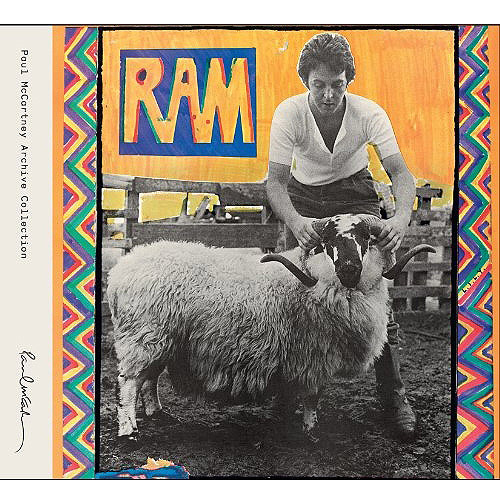 The cover of McCartney grabbing ram’s horns at a farm is the first introduction to the playfulness to come. The remastering job is nicely done, providing a fuller sonic representation of the quirky details of the production. However, it does reveal the plastic sheen of the album. The songs — most of them fun –come off as a happy diversion. Although, “happy” is the key take away because seldom has McCartney sounded so at ease and lighthearted. One of the standout tracks, “Eat at Home,” is reminiscent of 50’s-era pop. McCartney blissfully sings, “Come on, little lady/ Lady, let’s eat at home,” as his wife repeats in upbeat support. The song has an infectious groove that makes the “easy-listening” quality sound like a good time. Another notable song is “The Back Seat of My Car,” the most lushly produced on the album. It includes layered vocals and abundant strings. When both Paul and Linda coo, “Ohhh we believe that we can’t be wrong,” the innocent quality of their yearning is admirably authentic. Ram can appear slight and inconsequential. However, the songs are nicely constructed and are performed without guile—a quality that most singers and songwriters will never reach. And while the set of songs on this album may not count among the best of McCartney’s career, they definitely provide a pleasurable listen for both casual fans and ardent supporters alike.